XU Guoshuai, CAI Xiangjun, CHEN Jiangbo, LÜ Qing, LIU Hongtao. AEG-1 and CHD5 Expressions in Gastric Cancer and Their Clinical Significance[J]. Journal of China Medical University, 2018, 47(9): 797-802. Abstract: Objective To assess AEG-1 and CHD5 expressions in gastric cancer and adjacent tissues and explore the correlation between AEG-1 expression and its clinicopathological characteristics and prognosis in patients with gastric cancer. Methods Immunohistochemistry was performed to assess AEG-1 and CHD5 expressions in 58 gastric cancer tissues and their adjacent tissues. Results AEG-1 is highly expressed in gastric cancer tissues(43/58, 74.14%), whereas CHD5 is highly expressed in adjacent tissues(41/58, 70.69%). AEG-1 expression was closely related to the TNM stage, depth of tumor invasion, lymph node metastasis, and Lauren's classification(P < 0.05). CHD5 expression was closely related to the degree of differentiation, TNM stage, and lymph node metastasis(P < 0.05). The expression level of AEG-1 protein was significantly and negatively correlated with that of CHD5 protein(r=-0.595, P < 0.001). 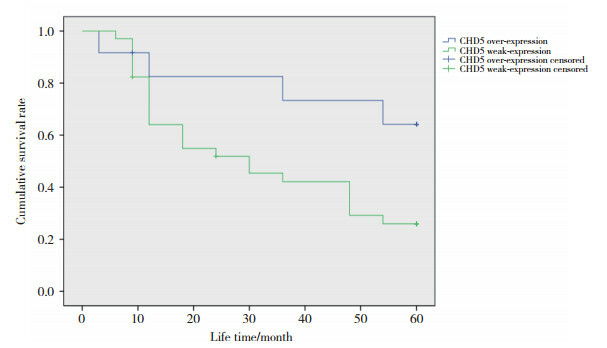 Survival analysis showed that the 5-year survival rate of the AEG-1 overexpression group was significantly lower than that of the AEG-1 low-expression group, whereas the 5-year survival rate of the CHD5 overexpression group was higher than that of the CHD5 low-expression group. Multivariate Cox regression analysis revealed that the TNM stage, tumor differentiation, AEG-1 expression, and CHD5 expression were independent prognostic risk factors in patients with gastric cancer. Conclusion AEG-1 and CHD5 are closely related to the invasion and metastasis of gastric cancer, which provide a new prognostic indicator for survival and therapeutic targets in patients with gastric cancer. AMIN MB, EDGE SB, GREENE FL, et al. AJCC cancer staging manual[M]. 8th. New York: Springer, 2016: 203-220.